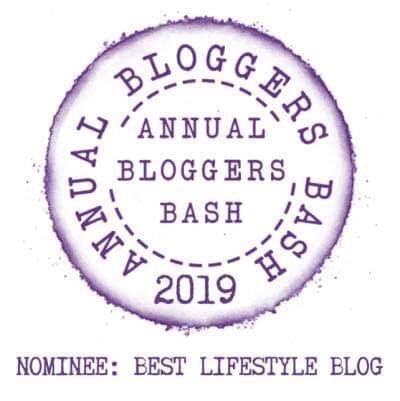 Talking shoes this week – but not just any shoe – oh no! 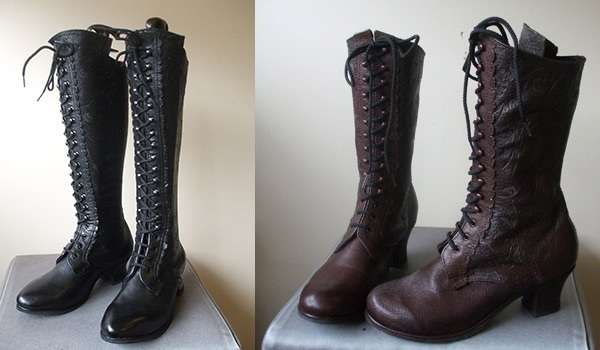 I’m chatting to a shoemaker who makes shoes for re-enactors, films, theatres, TV and museums from Madame Thaussauds to Plimoth Plantation USA, amongst others. His skill, attention to detail and workmanship really is wow – and I bet most of us have seen on screen, at least, a pair of shoes lovingly recreated by Kevin. Without further ado, let’s meet the guy … welcome, Kevin ..
Hi! 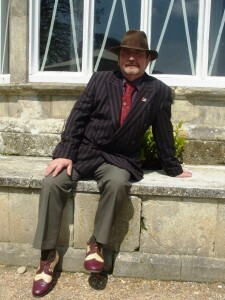 My name is Kevin Garlick, I am a shoemaker who specialises in making historic period shoes. 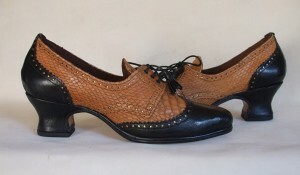 My all time favourite period are the shoes from the 1920s – 1940s. The age of sensible footwear. Have you always wanted to be a shoemaker? I worked in Engineering as a fabricator for half my working life but as manufacturing in this country declined I realised that it was time to do something else, so that is why I turned what was a hobby into a business. What do you like best about handmaking shoes for re-enactors, films, theatres & museums? I suppose there is a certain sense of achievement in knowing that lots of people will see your work. You have a background in re-enacting yourself – what characters have you portrayed? Who was your favourite? I was once very interested in the Napoleonic period and spent many years as a re-enactor. I was never interested in being an officer and was happy to stay in the ranks as a French infantryman. I also took part in living history events as a shoemaker, teaching and demonstrating to school children different periods of shoemaking. You have produced footwear for many famous institutions such as BBC Television, Shakespeare’s Globe Theatre, Madame Taussauds, and Plimoth Plantation USA. What was the hardest or most unusual footwear you have had to make? I have been involved in many productions for theatre companies, television, operas, and films. 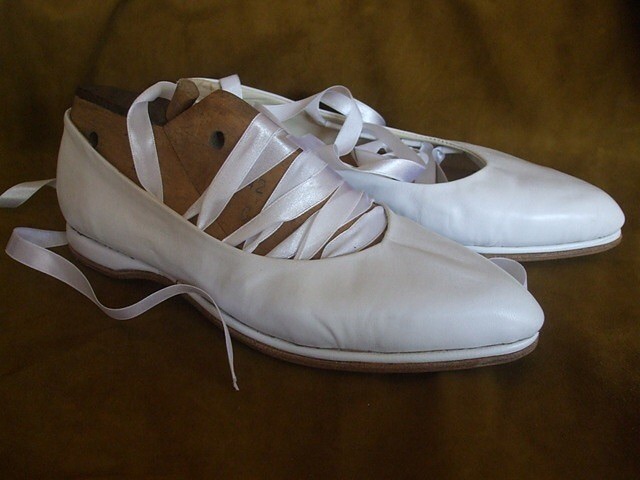 I would have to say that the most interesting work was for Shakespeare’s Globe as I was often making ladies shoes in men’s sizes and some of the shoes I was asked to make by the costume designer were often very unusual and not the everyday stuff that the re-enactors were ordering. The measuring process includes asking for 2 outlines of the client’s foot. What’s the main differences between bespoke footwear and “on the shelf” shoes? What are the most important measurements or details you need when making a shoe? The outlines and measurements of a customer’s feet are very important as a fit can only be as good as the information you are given. I ask my customers to draw around each foot with an upright pencil but you would be surprised how many of them get this wrong. Have you got a favourite out of all the shoes you’ve designed? 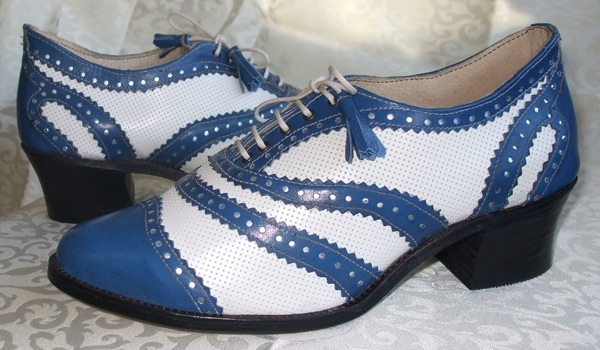 As I have said I love the shoes from the 1920s, I love the colour combinations and the different textures of leather and of course the styles. 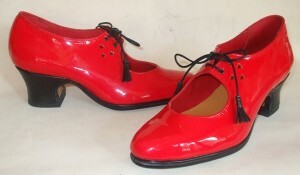 You specialise in making pairs of ladies & men’s Swing Jive shoes. 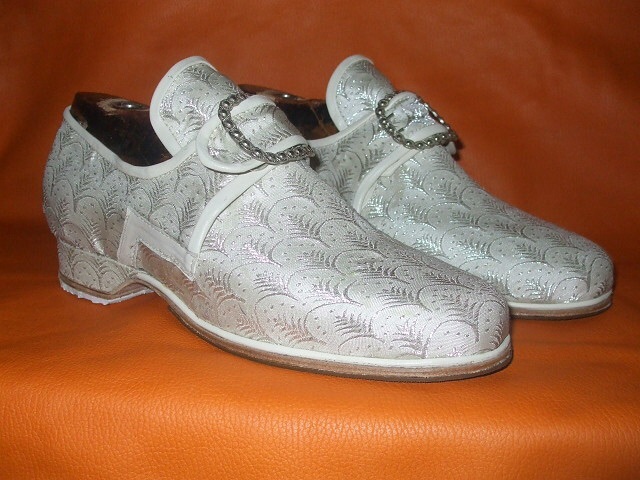 What is so special about these shoes? Shoes for Swing Jive and Lindy Hop are normally higher in the back than normal, also the shoes have to be well balanced for ease of movement and comfort. Particular attention is paid to the pitch and heel height so that the shoe can rock to lift the heel quickly for faster steps. What famous person would you like to see parading around in your designs? I have made shoes for lots of famous names but I can honestly say that although it’s good these people don’t ever think about the shoes as they are just a prop and not something personal to them. I get a lot more satisfaction making a pair for somebody who loves their shoes and appreciates the work that went into them, you never get this with actors. Were you ever tempted or are you tempted, to introduce “ready made” shoes to your repertoire in future? It would be nice to produce ready made shoes in stock sizes but then the shoes would all be the same just different sizes. By doing what I am doing I can offer customers a choice of colour and style and produce a shoe that is unique to them. 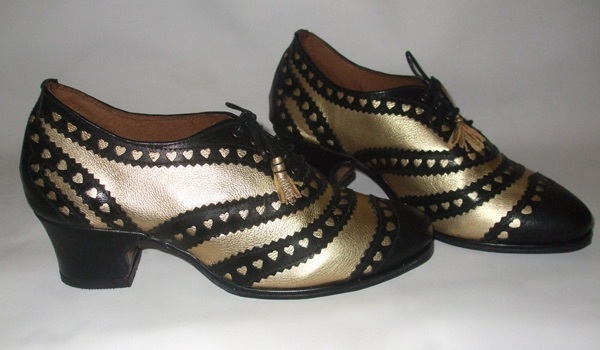 Normally I will be found in dirty old work clothes as I seem to be working long hours, but I still wear 1920’s shoes, although in desperate need of repair after five years of continuous wear. 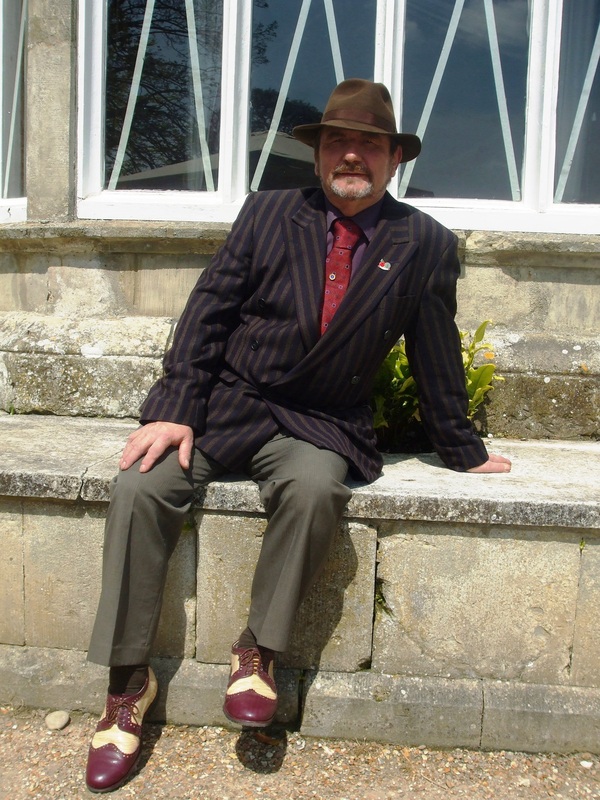 When I do get a chance to go out I usually wear 1930’s style clothes as I hate modern styles as everything is cheaply made and looks like a sack. 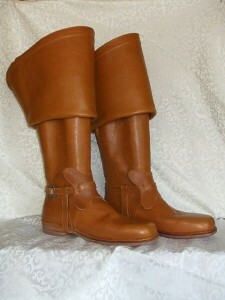 I plan to make a pair of 1940’s triple wedge sandals in red, white and blue. I have wanted to make these for some time but never had the time. It will happen soon as it has become a bit of an obsession. Thank you Kevin … I adore the shoes and boots! I find it interesting that some of the shoes from yesteryear are not too dissimilar to the shoes available for general wear today. I have shown photographs of my favourites out of Kevin’s collection – what era of shoe making tickles your fancy? Do drop me a line and let me know!